Dinner plates are on my mind right now as suddenly ALL ours are majorly chipped and we're down to just four, which isn't that sociable for someone who quite likes to host the odd dinner party and have friends for lunch - we really need eight at least. I find long-term purchases like this quite tricky as I think it's fair to say that plates are something most people only buy a handful of times in their lives, so you know, you need to get it right. Ours were a wedding gift, so they're nearly thirteen years old, and I have no idea where the plates in my life came from before that - probably hand me downs from flat-mates parents I imagine. But like it or not, tableware says a lot about you. If that statement is true, currently I'm someone who doesn't give a damn about presentation which I'm not particularly happy about, so it needs to change. I might ask for plates from my father in law for Christmas this year instead of the usual Diptyque candle. Don't get me wrong, I adore my Diptyque candles and being kept in constant supply by him (Birthday and Christmas), but you know, needs must. ANYWAY, I digress. 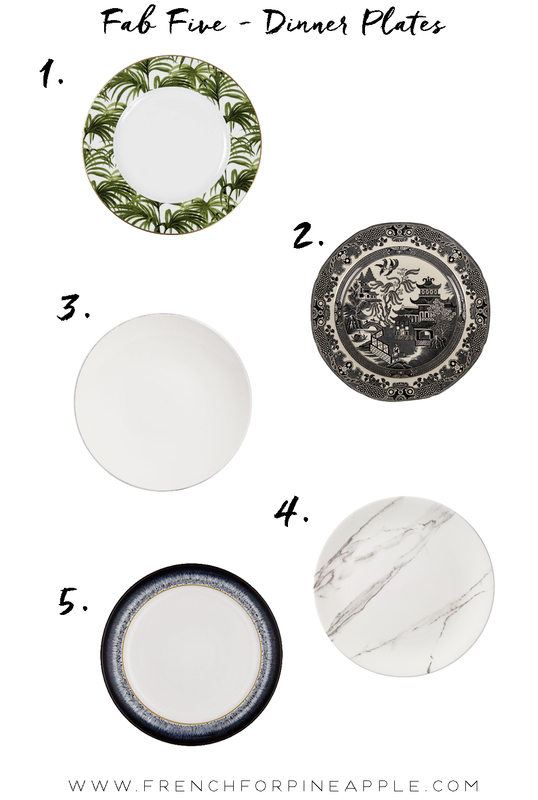 Have you guessed yet that plates are the subject of today's Fab Five? You know I love a bit of a tropical palm print, and this is a classic. I'm always drawn to Chinoiserie prints, and I love the way the black gives it a gothic edge. You can't go wrong with simple white, and the chunky earthenware with distressed glaze stops it from being dull. How stunning is this marble design?! Ugh, I die. Not normally my thing, but I kept returning to look at this beautiful offering from Denby, with the speckled glaze and ochre inner trim, these are timeless. Ha! I've never met a plate hoarder (though I think I have potential to become one myself!). Tell me about the gold stripey ones, they sound AMAZING!